Pu-erh tea (Puercha 普洱茶 - sometimes Puer, Pu 'er, Bo-lay) has been known for a few decades only here in the West. Origins for many myths here and in Asia, this tea is ultimately only a tea which belongs to the so-called Heicha 黑茶 or dark teas that are grown especially in southwest China and processed. 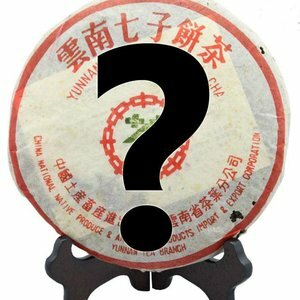 Pu-erh, by definition, is only grown in Yunnan Province 云南 , and particularly from the districts Xishuangbanna 西双版纳,Puer 普洱, Lincang 临沧 and Baoshan 保山 which accounts for the lion's share of production. Unlike most other Chinese teas Pu-erh does not come from Camellia sinensis var. sinensis. Instead mainly from Camellia sinensis var. Assamica - sometimes simply called qingmao 青毛. Pu-erh can be easily compared with wine: different terroir, producers and vintages. Wine also matures over time. Pu-erh tea is available in all its forms: loose (sancha 散 茶), discs (bingcha 饼 茶) nests (tuocha 沱茶), brick (zhuancha 砖茶), melons (Guacha 瓜 茶), etc. However, the real charm lies not in the form but in the taste diversity! Every region, every village, even individual tea trees and bushes have their own history and character. Many beginners hear names like Yiwu 易武, Laobanzhang 老班章, Bingdao 冰岛, Jingmai 景迈, Bulang 布朗, Menghai 勐海 and are already confused, but there is a myriad of old and new manufacturers such as Dayi 大 益, CNNP 中茶 or Fuhai 福海. 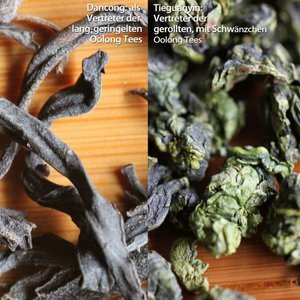 Last but not least the production process: raw / green [sheng 生] vs. cooked / artificially post fermented [Shu / shou 熟]), material (plantation n bushes [Taidi 台地] vs. old tea trees [Gushu 古树] and everything in between), and vintage. But without the big difference that fermentation by humidity, temperature, time, micro-organisms and fungi such as Penicillium chrysogenum, Rhizopus chinensis and Aspergillus clavatus there would be also no Heicha or Pu-erh tea. This brings us to varieties, including the various flavors: earthy, woody, leathery, chocolate, caramel, herbs, hay, mint, camphor, medicine cabinet, old books and more are all associations that can be found which varies on the different infusions, even a story, if you listen mag. Sheng 生, or raw/green, is the traditional and natural method, a Pu-erh manufacturing. For the first few years he is still greenish. However, by the factors time, humidity, heat and various organisms involved it changes like wine or cheese a fermentation process in which the tea is at about 20-30 years in the flavor peak. 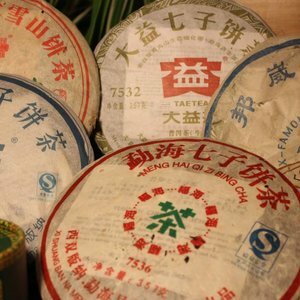 Shou / shu 熟, or ripe or artificially fermented tea is an early 1970s shorten invented method (at least for Pu-erh) the natural fermentation process. In simple, more moisture and organisms are added, the less time is needed. What was at first perhaps intended as a substitute is now a separate kind in the Pu-erh-universe. Organic or organically grown teas can be found quite often in Yunnan, but you can hardly find such commercially as organic declared products - especially not real high priced Pu-erh teas. Why? The local (European Union) Pu-erh market is too small and the law requires a relatively time-consuming and capital-intensive process. 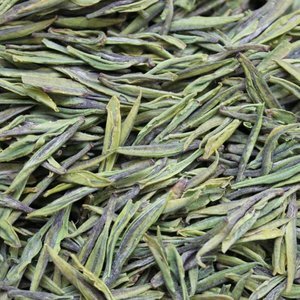 This is simply not worthwhile for many manufacturers, because they can sell their high-quality teas easily also in Asia at any price. However, there are still products produced according to Chinese organic standards, which, however, cannot be marketed as organic here, since the limit and requirements are quite different. Western brewing happens in a large pot, simply break off a little chunk of tea (approx.. 4-5g for 1L), put it in the pot and pour in 90°C water. After 1-2 minutes you can drink your tea. Not suitable for multiple infusions! Grandpa is to drink tea the most common way in China. Use a large and put 2-3g inside. Simply fill again with 90°C hot water. Wait until the desired drinking temperature is reached. But beware! Never finish the whole infusion, always leave about 1/3 water in the cup or glass. Afterwards just refill as many times you wish and the tea is still appreciable. Gongfu (- cha) 功夫茶 is the most ideal method, but not always practicable due to lack of time, hardware or passion. However, it can be shrunk to an essential degree as follows: a jug and another drinking vessel such as a cup or glass. Optional sieve and an intermediate vessel also called pitcher/fair cup or gongdaobei. 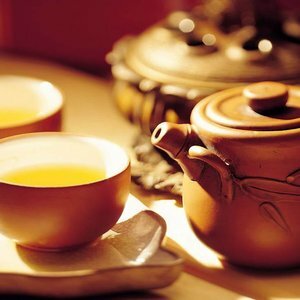 Pour into a small pot of 5g of tea into a small jug (e. g. Yixing jug with a capacity of 150 ml) and pour it again with at least 90°C hot water (which is really a lot in relation to Grandpa or western method), but after about 15 seconds pour the first infusion into either the cup or pitcher. Et Voila, the first infusion is done! After the same pattern we can now make further infusions, whereby only the infusion time varies gradually increasing like e. g. 15 seconds, 25 seconds, 35 seconds, 50 seconds, 70 seconds, 100 seconds, etc. until you don't feel like it or the tea doesn't give any more. Experience shows that this usually takes more than 10 laps! The temperature, infusion time and the amount of tea can be changed according to your taste. More means more intensive. Just try it out! Why this effort? Because it makes it easier to listen to the “story” of tea (the changes in taste). Firstly, you get a lot more out of your tea as a saver. Because it has a certain meditative function. And watch the water, please! 95% of all tap water in Germany is not suitable. Just like the totally calcified kettle. Clean it up. Lime kills the taste optically and sensory. It is better to use a clever mineral water or filtered tap water if you don't have a natural spring on your doorstep. In traditional Chinese medicine TCM, shu Pu-erh can definitely be attributed to warmth. 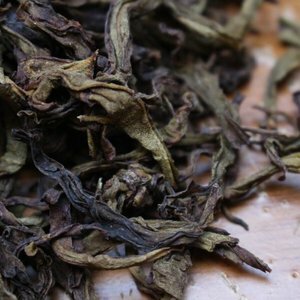 Young sheng Pu-erh tends to go in the cold direction, but gets "warmer" with increasing age. The tea has numerous positive properties, including detoxifying, purifying, and antibacterial, stimulating to the liver metabolism, regulating the digestive system, brightening the mood and lowering uric acid levels. However, it is up to you to decide what you believe. Really negative side effect such as increased risk of bone fracture could be disproved. However, in Tibet, fluorosis is reported to be the cause of excessive consumption, especially inferior goods. Pu-erh tea is generally not suitable for children! Pu-erh can help you lose weight, at least that's what some studies suggest, but as always no Pu-erh diet can replace a holistic approach. Tea is healthy, but not miracles drink. Pu-erh capsules are possibly even dangerous, and there are relevant warnings from consumer centers because of impurities. Also, you do not need to imagine all the great in a capsule to be able to. Very brief and simple: dark, dry, not completely airtight, but also far from foreign smells. A ceramic vessel covered with a linen cloth is ideal in the bedroom or guest room. Avoid kitchen and bathroom. Living room is only possible to a limited extent, because depending on the use of the room, certain odor waves can sometimes or even regularly blow through.